UPDATE (7/26): Following the publication of this post, Cuccinelli deleted the image from his Facebook page. 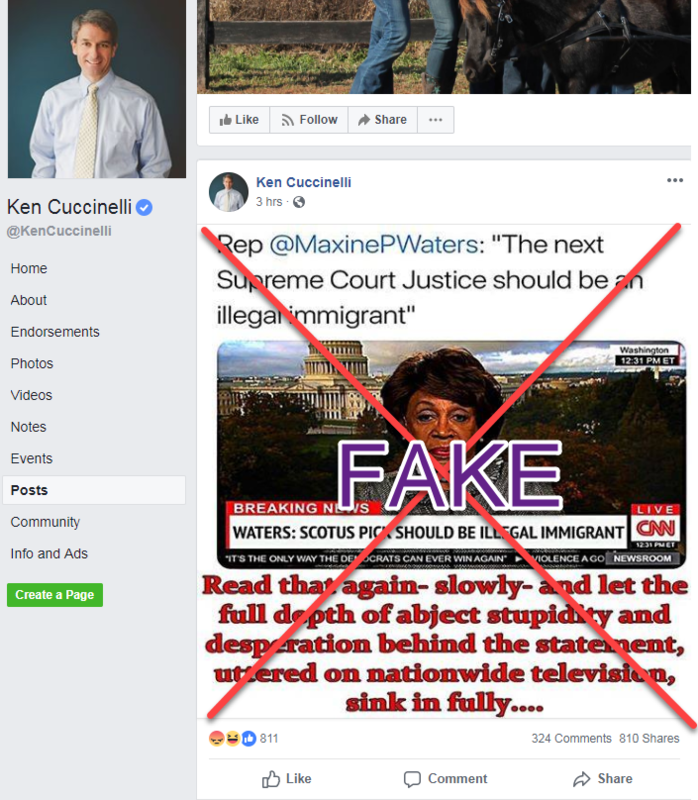 CNN legal and political commentator Ken Cuccinelli, a Republican who formerly served as Virginia's attorney general, shared a fake quote from Rep. Maxine Waters (D-CA) that an “illegal immigrant” should be nominated to the Supreme Court. In late June, a Twitter “parody” account pretending to be CNN tweeted an image of Waters appearing on CNN with a fake chyron that said “Waters: SCOTUS Pick Should Be Illegal Immigrant,” along with the text, “Rep @MaxinePWaters: ‘The next Supreme Court Justice should be an illegal immigrant.’” The fake quote and chyron subsequently spread as real across social media and radio, with multiple memes created around the tweet. Cuccinelli is not the first CNN contributor to share fake news. Last December, then-CNN analyst Harry Houck shared a fake story on Facebook from notorious fake news site YourNewsWire claiming that actor Denzel Washington had called former President Barack Obama a “criminal-in-chief” who “tore [the] heart out of America.” Houck subsequently deleted the post and apologized for sharing the fake story. CNN employees have done solid reporting in recent months on the background of Republican Senate candidate Roy Moore, who has claimed that “homosexual conduct” should be illegal and that Muslims shouldn’t be allowed to serve in Congress and in the military. During the same time, two CNN commentators have endorsed Moore’s campaign and told followers the country needs him in the U.S. Senate. Moore is a twice-removed Alabama Supreme Court judge and conservative pundit who is running against Democrat Doug Jones in the state’s December special election. Moore has a problematic history on LGBTQ rights, religion, and environmentalism, among other issues. 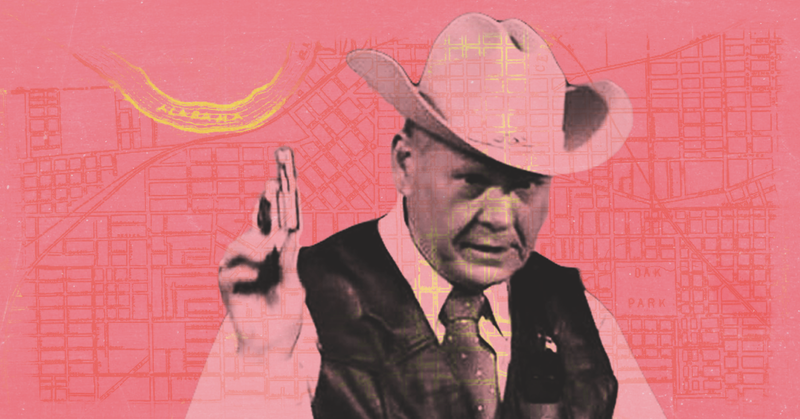 Moore’s campaign website lists numerous endorsements from politicians, far-right extremists, and members of the media, including Fox’s Sean Hannity, radio host Mark Levin, and Breitbart’s Steve Bannon. CNN legal commentator Ken Cuccinelli and CNN political contributor Ed Martin have also endorsed Moore’s campaign. 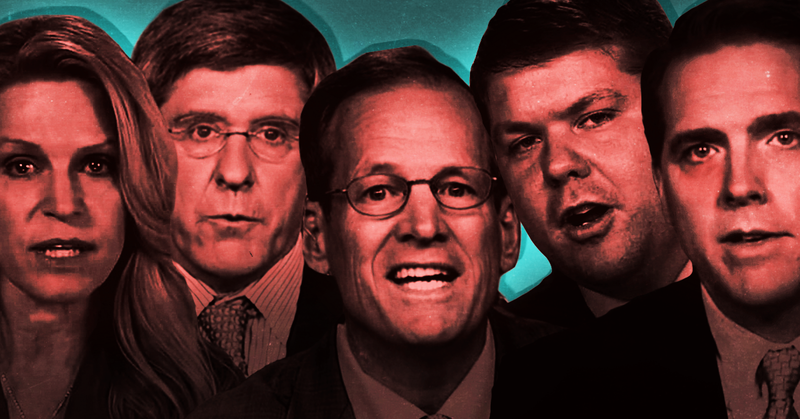 Both Republican commentators have anti-gay histories. 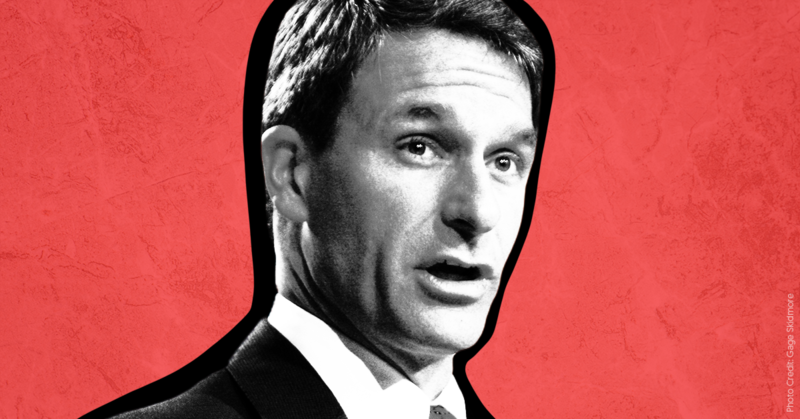 Cuccinelli supported anti-LGBTQ policies as Virginia’s attorney general and said, “When you look at the homosexual agenda, I cannot support something that I believe brings nothing but self-destruction, not only physically but of their soul.” Martin heads the organizations Eagle Forum Education & Legal Defense Fund and the Phyllis Schlafly Eagles, which have fought against rights for LGBTQ people. In 2009 and 2010, pro-Confederate activists held a “Secession Day” event at Moore’s foundation. 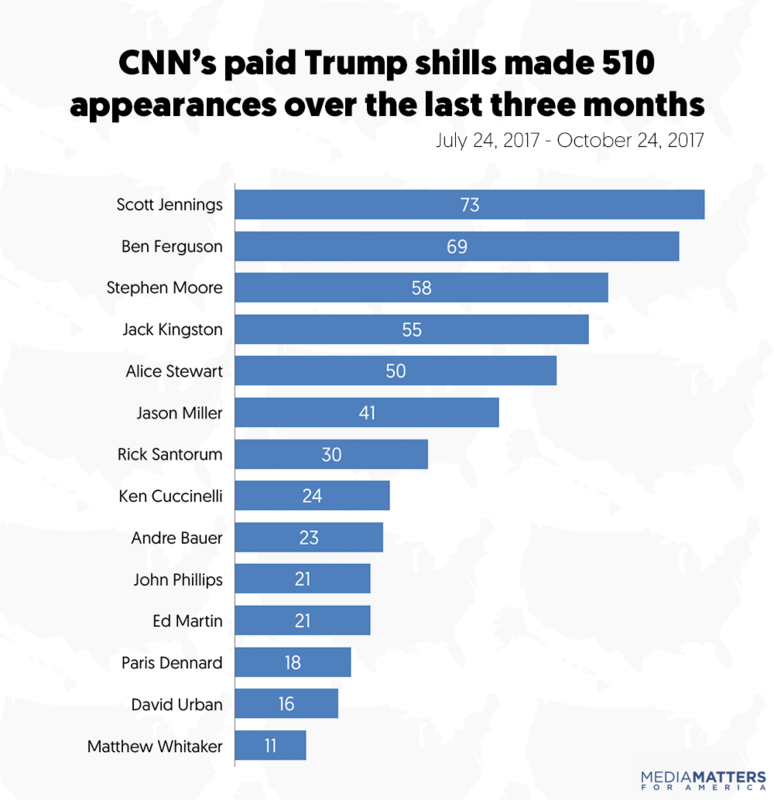 Media Matters has documented President Donald Trump and his Republican allies’ constant attempts to undermine the legitimacy of CNN by, among other things, calling it “fake news.” (Ed Martin himself has called CNN “fake news.”) At the same time, CNN employs at least a dozen pro-Trump commentators. Media observers, including Media Matters, have noted that CNN’s use of these explicitly partisan commentators has undercut the work of its journalists and turned the network into a sideshow. As Vox correspondent and former Media Matters research fellow Carlos Maza noted, “CNN’s Trump supporters derail segments critical of the president, misrepresent Trump’s positions to avoid tough questions, and peddle false and misleading information on national TV while being paid by the network. In many cases, CNN’s Trump supporters repeat the same lies and talking points that CNN’s serious journalists spend all day trying to debunk.” That sideshow is now in Alabama with the contributors' endorsements of one of the most extreme and anti-gay politicians in the country.